Intersegmental traction is a therapy that induces motion into the joints of the spine for the purpose of increasing mobility, stretching, and gently restoring motion in the joints of the spine. How does it work, you ask? 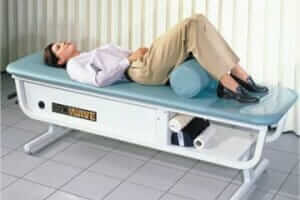 First, you lay (face up) on the table while the doctor helps you to get positioned correctly. There are rollers underneath the surface of the table that are positioned to contact your lower back, mid back, and neck. These rollers gently press into your back and extend and traction the spine in those regions. Many people say they love this treatment and that it feels like a massage, but more is happening than mere muscle relaxation. The doctor will ask if the current setting of the table are comfortable for you and adjust the intensity of the traction depending on your condition and your tolerance for pressure in those regions. Traction is best used in conjunction with chiropractic and exercise therapy to get the full benefit from it’s effects.